If you are a fan of YouTube, reviewing archery videos or a reader of various archery magazines you will probably have heard of or encountered Jim Kent, or rather Jim “Grizzly” Kent. He has been producing videos for years, originally on his own channel Archery Adventures and more recently for Merlin Archery Adventures. I was lucky enough to have Jim agree to be the subject, or should that be victim, of this article. So here you have it, a Walk with Jim Grizzly Kent. So on a crisp beautiful autumnal morning I met up with Jim to have a shoot around a woodland and chat. Rob – You are pretty well known to many on the archery circuit, thanks to your videos or articles in magazines, but how would you describe yourself? Jim – I’m not sure. I like to think of myself as a traditional archer that shoots instinctively. I know someone once described me as an ambassador for instinctive archery. Rob – How did you first get into archery? Jim – I was about 4 and I found an arrow in a shed at home and I was fascinated by it, I then found the bow. I couldn’t draw it but my Dad made me a simple bow and a few arrows. I was off then shooting clumps of moss or tree stumps in the woods. Guess I was stumping before I even knew what it was. Rob –So can you explain what your love or passion is that drives your interest in archery? Jim – It’s special to me, Traditional archery. Archery as a whole has always be a part of my life especially the traditional side. It’s something special, it speaks to me. Whether or not I could ever put a finger on why? I don’t know. Maybe it’s reliving running around the woods with bows and arrows, which is something we all wanted to do as a kid. Something some of us did as kids with arrows with suckers on the end and what not. Rob – is that where the title came from for your original YouTube channel? Jim – Yes, it’s where the original title of Archery Adventures came from. Ever since I was a kid the idea of adventure inspired me and as you get older they get less and less adventurous, as you get older and older and realise how the world works. Rob – So why did you start the YouTube channel? Jim – Don’t know if you’ve heard of an archer called Chris Bilingsgate, he has a YouTube channel (Billingsgate Unlimited) and we got talking on a couple of forums initially, then we had a skype chat and he suggested I could make a video. He said I should make a video, but I didn’t think anyone would watch it, but he convinced me to give it a go. That’s how it started. So the first was filmed on my parent’s dining room table “An introduction to instinctive archery”. The sound was awful and had me rambling on, not much changed there. Rob – Sorry Jim, but I managed to find the first video https://www.youtube.com/watch?v=CQrjDu1Hn2A great to see how the beard has grown over the years too. Jim – I really enjoyed it and it got a couple of hundred views in first few months. I was working full time and doing this in my spare time. Jim – That was the first step. Then I made one on making arrows. This is kind of ironic, as I’ve just done a new recording on how to make arrows for the Merlin channel. Gradually the views went up and the subscribers went up and then from nowhere suddenly the subscribers went boom and up and up. Rob – You’ve come a long way in a comparatively short space of time, since that first YouTube video. You’ve now got a following on Tumblr and YouTube of not just UK archers, but a global following. Was it hard initially? Jim – Everything was self-funded at that early stage, with bits I had bought and then reviewed. That led to Merlin sending me a few bits and bobs to review. Then I got a job doing it with Merlin a few years later. Rob – So if ten years ago I’d told you where you’d be today, how do you think you’d have responded, would you have believed it? Jim – No not at all, it’s weird. I tend to let life just play out. Never forced anything, what will be, will be. I started the YouTube channel because maybe I like sharing my experiences or just the sound of my own voice. Having shot half the course we afforded ourselves a break and continued our chat over a cup of coffee to keep ourselves warm. Jim – I do genuinely enjoy writing, I love writing when I have the time, and though it was something I had to work it to get good at, largely due to being dyslexic which was identified in childhood, but didn’t get the support from school at the time. I quite regularly write for Bow International magazine, and lucky to have some friends that are good photographers who produce some great pictures. I used to write for Stick and String an online magazine which sadly no longer exists, along with Archery UK magazine which you get with membership to Archery GB. Also there is a new one Field Archers News UK. It’s finding the time and not trying to force the creativity as that doesn’t work. I need to have the idea and inspiration; I need to come to it naturally. I can’t magic something up to write about as I feel it comes across false. If you force it, it becomes a boring read. Need to feel passionate about the subject. One thing that was very clear when shooting round with Jim, was how much he misses shooting for fun. The recreational shooting we all enjoy without having to worry about testing this bow, writing and producing a video etc. Okay, so he’s in a position many of us would love to be in, with a job that allows him to try out new bows, record videos on archery events round the country and more. But I think this is at the expense of shooting for fun. The irony being this is the very reason that got him making videos in the first place. The other thing is he loves taking photos, whether it is the light through the trees or his bow in the sun, his phone is out and he’s snapping away. Rob – When we were wandering round the woods we were talking about the fact you’ve always been an advocate of the traditional style and the instinctive shooting technique. What do you see as being traditional archery? Jim – No sights, and a simple bow. The simplicity of the bow is important, even if it’s got glass fibre or carbon in the limb make up. 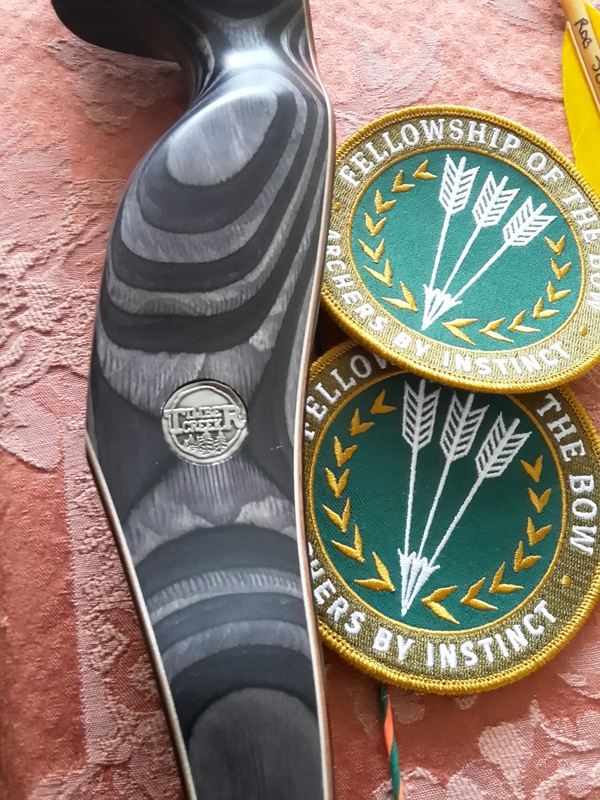 In essence a simple bow, a wooden bow, shot off the shelf, feathered arrows, no pressure button etc. Shooting off the shelf is a big part of traditional archery, I feel. Rob – So having finished our drink, it’s time to head off and do the other half of the course. Which is a good time to ask about how competitive archery features in his thoughts. 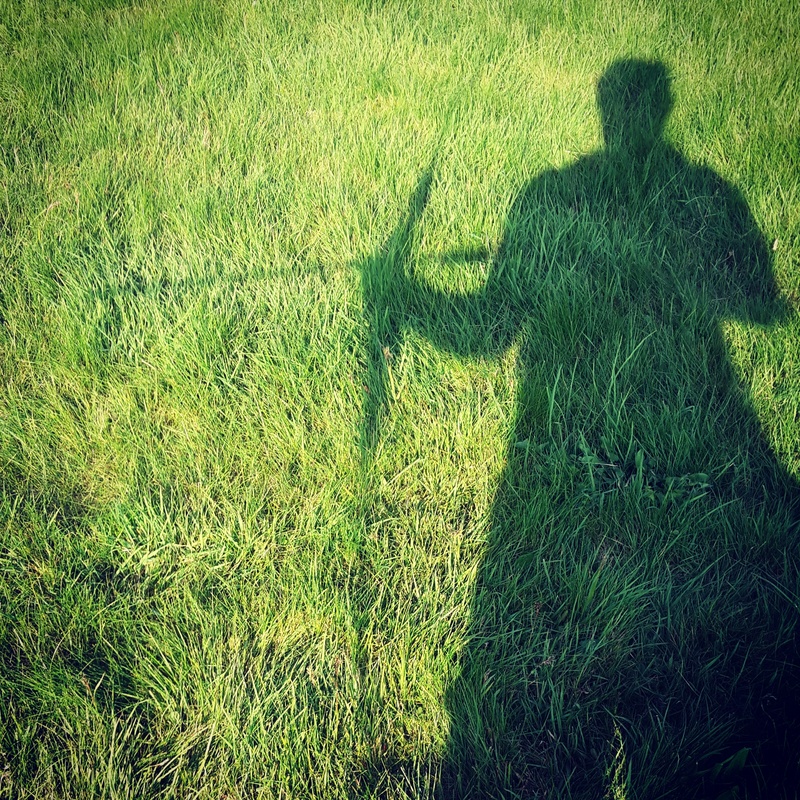 Jim – Traditional archery to me is more of a lifestyle than a sport. Yes you can compete, but I don’t see it as a sport. I am competitive but I don’t enjoy being competitive, but when I am competing I want to win. But I don’t like competing. Doesn’t sound too opposite, does it? I hate scoring. 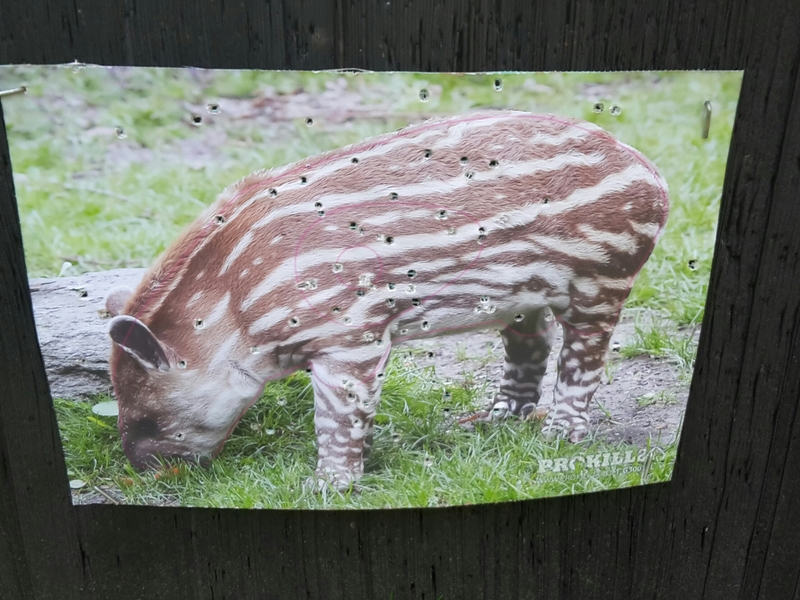 Rob – Guess the problem is that being known, means people expect you to shoot well, which can distract from the enjoyment. Jim – There are different competition circuits out there with EFAA, NFAS, Archery 3D, Archery GB. World 3ds has an instinctive archery class that suites very much the way I shoot. A traditional bow shot off the shelf with carbon arrows, where you’re not penalised for using carbon arrows. It’s more of a class than a way of shooting, but I’d want to use this as a platform if I could to raise the profile of traditional archery. Rob – Another thing you learn very quickly about Jim is not only does he know a lot about archery and a good shot, but he also has a sense of humour and loves playing practical jokes. So it is not unusual to see him collapsed in a corner of a wood or under a tree, trying to stop laughing, having succeeded with one such joke. Photographic evidence of this can be seen here and yes they did eventually retrieve the arrow from the tree. It appears Jim and I share another passion other than archery, that of being in Autumn woods. I have to agree with Jim that Autumn is one of my favourite times of year and there was more than one time we stopped to watch the “leaf shower” as the autumnal leaves fell from the tree canopy, leaving a mosaic of colours and patterns on the woodland floor. Jim – The Gathering is why I do archery, it’s social, friendly made up of diverse group of archers and abilities. There is so much diversity in traditional archery. It’s about being in the woods with people you care about, who are your friends. It’s special. Rob – Can I talk to you a bit about the Gathering. We’ve seen the videos of the Gathering and it does look amazing. It comes across as a group of friends and people passionate about archery, having fun. There are facilities in Europe that can accommodate that style of event, not something that we have here in the UK sadly. But even in Europe there are limitations based on size of the accommodation, that’s why it’s remained small. Rob – I guess if it became a bigger event some of that social interaction would be lost. You’ve said archery is a very inclusive activity, can you expand on this? Jim – I find with the traditional side of things it’s so much more accessible. You can spend £200 on a nice little flat bow, half dozen arrows, quiver, maybe a bag target and from that moment you can enjoy archery. You can enjoy the pleasure of shooting arrows down range. Rob – So what of the future of traditional archery in the UK? Jim – When I’ve been to Europe and the Blackforest. You can turn up to a course. Hire a bow and arrows if you haven’t got them. You see people with pushchairs with a bow on the back, going round, stopping taking a shot and then dropping their bows back on the push chair and carrying on. It’s a family activity or day out. Rob – the Olympics opened up a number of sports to people like cycling, rowing athletics. Jim – Yes we see it every 4 years, when there is a hike in interest in archery when the Olympics is on. Most target clubs will offer Olympic style recurve but that it, but there isn’t much deviation. Don’t get me wrong there are some that offer other styles but not many. Also many see traditional archery as shooting a longbow. There are traditional styles that aren’t just English longbow, there is recurve, hybrid or flat bow. The reason it fascinates me is there is so much diversity in field archery. I believe if you offer people the chance to try it and they’ll love it, then traditional archery will be bigger. There’s a whole other world of archery in the woods. Rob – It’s not just the Olympics that has triggered interest though. Films like The Avengers, Brave and the Hunger Games have all encouraged people into trying archery. Jim – Let’s get something straight, I really like the Hunger Games. Anything that gets young people into archery is great. I shot a YouTube video about the Hunger games and a few people got the wrong idea. Rob – So if you could reach every newbie archer out there with one single piece of advice what would it be? Jim – Drink in all the advice you can find, search for it everywhere. There are so many people willing to give advice on YouTube and all social media, enough to last a lifetime. Never takes one person’s approach as gospel as you need to find what works for you. Then apply to you what’s relevant to you, some of it won’t appeal other bits will. Not everything that people do is relevant to you or the way you shoot or want to shoot. Do within archery what makes you happy. There is a polar right and a polar wrong. Everything else in between is what you make of it. There are no hard and fast rules, though there are fundamental concerning safety. Shoot what makes you happy, if you like shooting the Olympic style bow or a longbow. If it puts a smile on your face, then do it. Learn your own path. What’s good for the goose isn’t always good for the gander. Reason it fascinates me is there is so much diversity in field archery. It’s been said that every journey starts with a single step, well every journey ends with a step too. So as the sun begins to go down I think that is a good time to quiver our arrows and head home after a great walk and talk. Wish my archery had been as good as the company. Many might see Jims’ success at having a career in a hobby he loves but think about this. Careers in our hobby, like other sports are not easy. With often long days and working weekends, which must be hard with his young family? It also reduces the time he has for recreational shooting or time with his family and friends or to commit to clubs. Work / home life split is hard for so many of us and when you are in the social media limelight, fronting a company or line of bows it must be a double edged sword. A mix of doing something you love and hit the target. But this is at the expense of shooting for fun, the very thing that got him in to making archery videos in the first place. There’s a degree of irony in that I feel. On a personal note the few hours we spent wandering round the woods shooting and chatting was very relaxing and just what the doctor ordered. I believe it is the Japanese who have a theory called “Shinrin-yoku “ or forest bathing, taking in the atmosphere of the woodland, makes a lot of sense to me. One thing that stands out when you talk to Jim is his passion for the hobby, which is so evident as he speaks about his archery experiences. Think the description ambassador is pretty accurate. Some people love being in front of the camera, others prefer to do the filming. The question is can video resources help you if you are an instinctive archer?A few weeks ago I posted an article on how we’ve been using a tablet computer mounted on a tripod to record archers at a club coaching session. So How does this help? This aids the archer as they can be shown exactly what they do when drawing up or at point of release. How their hand moves or whether they drop their bow arm. Often they think they are anchoring correctly to the face when in reality they aren’t because it all happens so fast , too fast for some to process. Recording them has huge benefits to the archer’s understanding of what they are actually doing as opposed to what they think they are doing. Talking to fellow club members on Sunday they showed me footage shot on their iPhone, playing it back in slow motion to watch the arrow flight. With the growth of YouTube and ease by which people can make and edit their own recording I believe there are more budding Spielbergs are out there. It is now common for touchline judges and sport referees to make lots of use of instant replays in games, multiple camera angles along with slow motion footage to aid their decisions. Managers and coaches use it for post match analysis of players performance, game plans etc. So can we use it for our sport of archery, or more precisely for those of us who consider ourselves instinctive archers. I believe it can be used. From my perspective I believe video resources can be immensely useful for many sports, field archery included and they are becoming more common. One word of note, there are advantages and disadvantages of these helpful guides and video tips. For starters some may not be that helpful, so it is worth checking out multiple sources of information to get a more rounded understanding of the topic. If you are going to review these resources then make sure you watch a few different sites or techniques as each presenter convoys a slightly different perspective when they narrate their story. The important thing to remember is that they aren’t always right in what they say. Instructional recordings where a skill is demonstrated. Video reviews of equipment, competitions or locations. Instructional – these vary in length from a few minutes to longer durations. Short duration clips of a few minutes I think can be ideal for helping archers out on different topics from how to serve strings, to fletch arrows, to how to aim and shoot instinctively. The short duration is an important factor here as long reviews might go into more depth, but they are harder to find time to watch. Wolfie instinctive archery (https://www.youtube.com/user/Wolfiesairbrush) YouTube channel has some great advice for instinctive archery techniques. Equipment reviews are good to so long as they aren’t marketing based publicity. I’ve come across a few that are more about selling the product than actually reviewing it’s merits and flaws. Jim Grizzly Kent Archery Adventures (https://www.youtube.com/channel/UCxl7N0J9Rc8kDnjV_BzH-yg) still comes across as a good product review even though they are now Merlin Archery Adventures. I think Jim does a pretty good job of giving a balanced viewpoint of the bows he reviews. I also quite like the personal achievement videos; when someone has posted their own success story. You often see these pop up on Facebook sites and YouTube. It can take a lot of courage to put yourself out there for all to see and comment on. There are a lot of people who enjoy criticising others or simply being argumentative. 3d archery (https://www.youtube.com/channel/UC4HdCXofIA4jsWi1q9AdBUA) have some nice event reviews, showing shots from different courses, offering advice and views. There are loads of different sites on the Internet so I’ve listed a few others sites that are worth a mention too. Ironmind Hunting (https://www.youtube.com/channel/UC9zPmJfjW2R9r0y2uUzq9aQ) has some good instructional guides. Jeff Kavanagh (https://www.youtube.com/channel/UCgGoY0qpH8f11COXWkE8aLQ) is worth checking out for a mix of archery related topics. Nathan Skyrme channel (https://www.youtube.com/channel/UC1kxvgSeCWZXdg4I6_BI5Zg) has also started producing some material and equipment reviews. If you know of any others that you believe are worth sharing then add a comment here. Making videos where I’m in front of the camera has never appealed to me. As someone once said “I have the perfect face for radio” , but I can see their merits. Thanks for reading and don’t worry, I won’t be coming to a YouTube channel near you.